The tall ship Evening Star docked at Port Phillip harbour in February 1856 carrying the Pettavel family, destined for the expanding vineyards of Geelong. Experienced growers recruited in Switzerland were central to the expansion of viticulture and winemaking throughout the Bellarine Peninsula. The Evening Star range is focused on articulating the vibrant Geelong fruit characters, a course of cool ferments serves to retain the lifted elegant, floral aromas and crisp citrus, apple pear flavours, which linger on a fine, mineral acid texture. 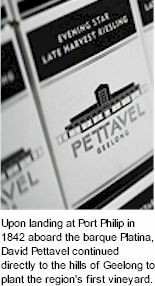 Riesling is a relatively new variety to the Pettavel Vineyard, but it has produced stellar quality wines and attracted gold medal wins from the first vintage. The grapes ripen very late into the season, the effects of cool nights ensure that crisp natural acid levels are retained, while vibrant floral aromas and flavours continue to evolve. Vine mulching, hard winter pruning and attentive viticulture get the desired result. Healthy, evenly spaced, vertical positioned shoots form a dense leaf canopy, shading the grapes from the summer sun, capturing intensely perfumed aromatics. The growing conditions are ideal for full physiological flavour development and acid retention, ensuring a balance of ripe fruit flavours and crisp acid. Light straw hue. Intensely aromatic, with an element of richness to the bouquet. Vibrant youthful fruit flavours including apples and pear, melons and lime, crisp, vibrant and floral, the palate captures the richness of ripe grape, achieving a wine which drinks brilliantly upon release, while fulfilling the promise of beautifully mature Riesling characters for those who are willing to wait.